You can water your vegetable garden several different ways. 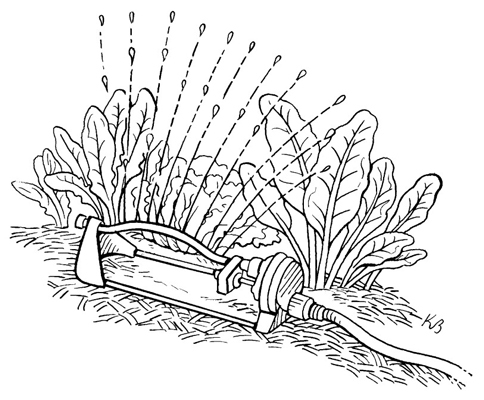 Basic watering techniques for vegetable gardens include creating simple furrows and basins. Watering systems involve sprinklers, regular hoses, or soaker hoses. The most complicated way to water plants is to install a drip system. Furrows: Furrows are shallow trenches between raised beds that channel water to plant roots. This watering method is based on an old farming technique of planting on narrow raised mounds or beds and then using furrows to water. The beds can be 1 to 3 feet apart — the wider apart they are, the more water you use. When you’re ready to water, fill the furrows completely with water, wait a while, and then poke around with your finger to make sure the water has penetrated the bed. It takes time for the water to run from one end of a mound or bed to the other. The beginning of a row always gets more water than the end. You have to move your hose around a lot to fill each furrow. Water is wasted through evaporation as it’s sitting in the furrow. *Basins: A basin is a donut-like depression around a vegetable plant that you fill with water. You make a basin in a 2-foot-diameter circle around the plant. *Hoses: Watering with a hose isn’t the ideal watering system and probably is best for watering containers; for watering individual, large plants such as tomatoes; and when used in conjunction with the basin method. In these situations, you can be sure that you’re applying the right amount of water to your plants. The best way to water your vegetable garden with a hose is to leave the hose running at a trickle in a basin near each plant until the water has soaked down at least 6 inches deep. Sprinklers: A sprinkler is effective for watering vegetables planted in sandy soil that absorbs water quickly. It’s also an effective way to water a large garden when you’re pressed for time. However, if you have heavy clay soil that absorbs water slowly or if your garden is on a slope, the water may run off. Portable sprinklers (shown) and in-ground permanent sprinklers are great for watering large areas if you’re pressed for time. Constantly wetting the foliage of vegetable plants can encourage disease problems. So when you use a sprinkler, water in the morning so the foliage can dry before nightfall and so you lose less water to evaporation. Soaker-hose irrigation: A soaker-hose irrigation system consists of a rubber hose perforated with tiny pores that leak water. You can lay the hose between rows or curve it around plants. With a soaker hose, water leaks out of the hose and onto the soil, leaving foliage dry and reducing evaporation. Using a soaker-hose system is easier than using a drip irrigation system because it involves fewer parts and no nozzles. 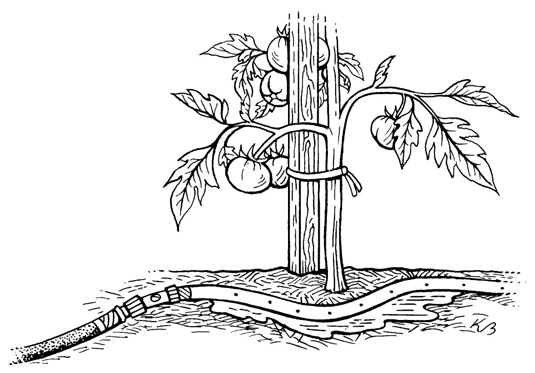 Drip irrigation: A drip irrigation system provides water slowly through holes, or emitters, in flexible plastic pipes. Many different drip irrigation systems are available; they can consist of a single pipe with flexible lines running off it, or a series of pipes. 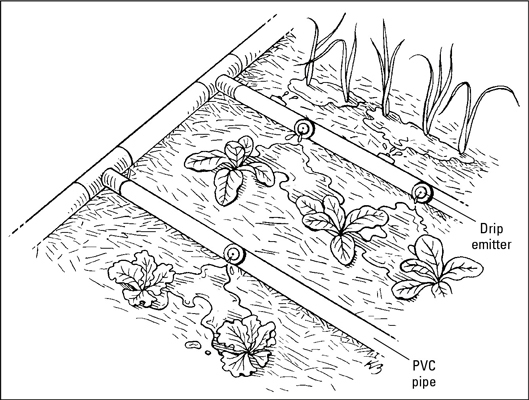 You weave these pipes — which are connected to a water supply, a filter, and often a pressure regulator — along rows of plants so the water flows directly to the roots of your vegetables. Drip irrigation is the most effective and efficient way to water vegetables because water drips right to the roots of the plants and little water is wasted. The downside to drip irrigation is that it’s more costly than the other methods. Drip irrigation is best for those gardeners who are into technology, who don’t have lots of time to water, and who live in water-restricted areas.